NASA have put out a press release about an observation of WASP-18 by the Chandra X-ray observatory. 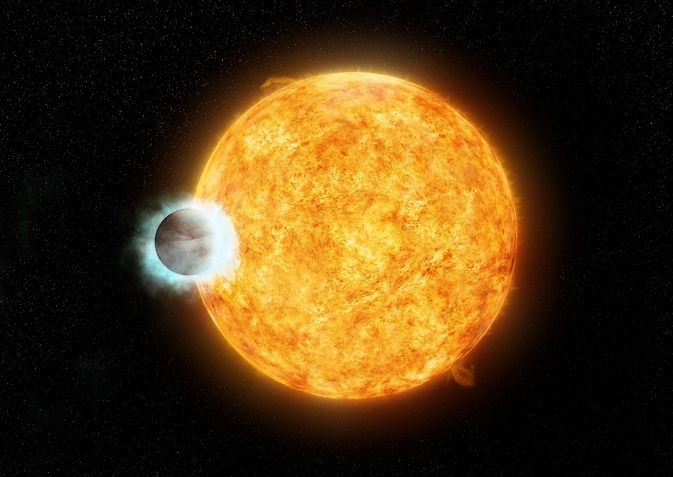 WASP-18 was the first planet discovered to have an orbital period of less than 1 day and has the highest tidal interaction between a planet and a star of any known planetary system. “We think the planet is ageing the star by wreaking havoc on its innards”, report the authors of the paper, “The planet’s gravity may cause motions of gas in the interior of the star that weaken the convection”, which “results in the magnetic field becoming weaker and the star to age prematurely”. This entry was posted in WASP planets and tagged Chandra, NASA, WASP-18 on September 18, 2014 by waspplanets.